In the many philosophical traditions that continue to direct our every day lives, birth is not the beginning and death is not the end. These are parts, of a larger cycle we believe is life. We see ourselves as ‘aatama’s that inhabit bodies or vehicles, that are born, grow to fullness, act out their purpose, and then when spent, perish. To the architect the object of all architectural practice seems to be the building. This building, that the architect occupies himself with, is always created(in a de-facto sort of way) to be timeless, or seeking to be timeless. That it may outlast the relative short span of the human life. And in that, deny time as a measure of the human life span. Thus the building possibly becomes timeless. The building becomes im-mortal to man. And man finds the vehicle to his own immortality. An indelibility of presence in a world we are no longer able to inhabit. Sometimes even kept alive, un-allowed to die: “Gerontion-ed” like Eliott’s “old man in a dry month waiting for rain”. As architects we find comfort in the immortal building. It is a warm, reassuring relief in a life of ever present fear of erasure.There is no vision of a demise. Buildings are god-like, un-dying, un-aging, born to eternal life. We see them as permanent, everlasting and un-destructable. Life-span forms no part of the architects construction of a building. I have no conception of the mortal building. I am not used to the building that dies, that is so willed to. A building that will live out its life, and when its many materials and parts start to fade, it will make way for a newer edifice, a son or daughter. A building that will exhaust itself and make way for the young of its kind. New buildings that will begin where their parents left off, in a tradition that, would deny not time, but would be timeless. I cannot see buildings as dying (they are either decayed corpses, or veterans on life support. ).This is the thinking I have schooled in, and practise in. Somehwere in the old almost forgotten fabric of our built environment there is another thinking - of a craftsman in a centuries old tradition, that has erected edifices for generation upon generation, in a nameless, faceless, anonymous effort. A thinking I encountered over a year ago as I spent a few days with a team of these craftsmen at work in Sarahan. (every thing must at some point perish or reach the end of its usefulness)”. Words that have kept ringing in my head since. He said the temple was old, worn and had lived out its life. So they took it down and rebuilt it. That is what was done, in a tradition of craft that I encountered across the many settlements of Kinnaur. Here temples are reborn regularly. The Bhimakali temple in Saharan, is one of the larger temples of Kinnaur, a splendid example of the Kinnaur Temple style. Legend has it that in an earthquake in the early 1900s this temple was shaken rather roughly and developed a sharp tilt. This tilt was corrected in a subsequent earthquake. But life, as it does with all things, took its toll. I am not certain when (chronology not being a concern), the complex’s main temple to Bhimakali was dismantled, stripped down to its foundations. In October 2007, as I sat with these craftsmen, the rebuilding was almost complete. To the rear south-east corner outside the temple wall in a large wood-working shed of G.I. sheet and tarpaulin, planks were being turned into floral reliefs, logs into columns, carved and ornamented. There were about 20 craftsmen working silently, as if they had the perfect knowledge of what to do. And every now and again a young man would walk through, pass a few instructions, turn a log over, mark a line or stroke on it and leave. The log would be cut, shaped and be taken away. And other such silent instructions passed. Through a parting in the canvas sheets one could see the recently built upper storeys and roof of the new temple bathed in the mountain sunshine contrasted against the older outer structures and an older temple to its east. The new temple at Sarahan is not the old temple, but it is not a new temple. Could one say the old temple has been reborn like some enlightened being who’s spirit attains release from his mortal body and has chosen a new body by which be renewed and carry on the holy work. It is new(and it is not), modelled on the edifice it replaces, yet not copy; subtle markings announce this rebirth. The introduction of newer material is deliberate, clear in intention and adds to the historical narrative. The window shutters of the 3rd floor balcony have glass panes, and the relief work of the shutters reflects the new materials transparency. Alongside, an older edifice wears timber shutters, and the difference reads out beautifully. Lathed roundels hang from the eaves, shaped anew and marking their rebirth as if- proudly proclaiming their creation from newer tools for shaping. The temple is at once new-born as it is centuries old, effortlessly spanning time and change and technology in small gestures of material, craft, and detail that tell their story to the seeing eye. But everything is not new, the walls are centuries old, but fresh deo-dar logs and chiselled stone tell of the new life. There is no obsession with the idea of symmetry, timber lengths determine the jointing of wood bands that make up the striking three floors of dhajji construction. And windows are placed as they have been for centuries, where needed, unapologetic and bold. Even the entrance is not centered. There is no desire for a formal symmetry, there is no need, and there is no place for what is not needed. The building displays a fine and deliberate balance between the materials at hand, a need and craft. Needs are informed by local materials and availability. And from these constarints a treasury of craftsmanship knits together a seamless expression of the wisdom and skill of centuries. In the months that went before that October, a team under a master builder had rebuilt the central edifice of the temple. Striped it down, and rebuilt it, log for log, stone for stone. The Bhimakali temple had been reborn. Like it was reborn before(? 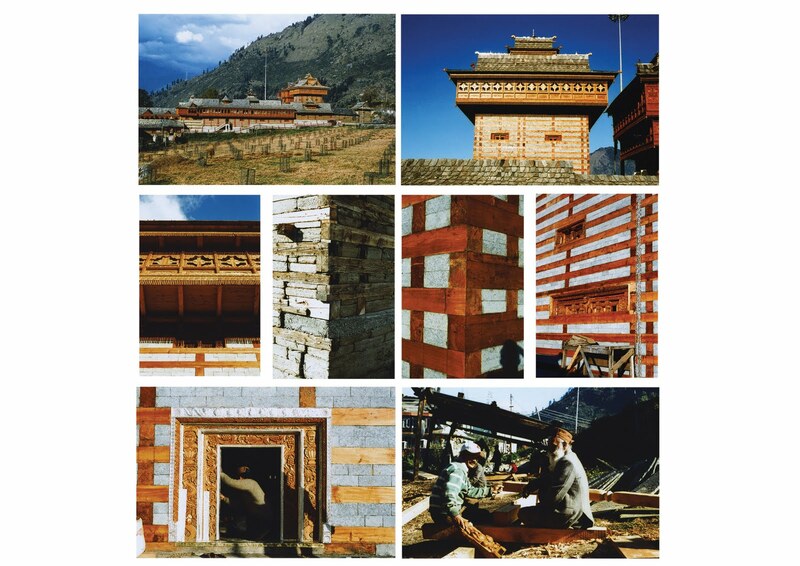 ), in a craft tradition that has survived, and can be seen in the villages of Chitkul, Bhatseri, and elsewhere breathing new life into aged and weary temples built by the forefathers. In the tradition of my education I am not used to the building as mortal, as replaceable, rebuildable, renewable, and perishable. I have no precedent to see the possibility of death and birth as acts of renewal. The building is beautiful, every detail, crafted with exquisite skill and assembled as the work of human hands. The building is the living body of a tradition of craft, of life and possibly even philosophy. A tradition that looks at the building, even for the gods, as transient. There was no attachment to the idea of the building. One sees no shot at fame or immortality for its maker. Each building is built as best it can. Built from need as much as with what is available. To last as long as nature and its material permit. To last as long as it might be needed. The building is a craft tradition, where nothing is larger than life and there is no attempt at any kind of monument. It does not have to be permanent. It will be rebuilt. The built environment in the craft tradition is the result of a communal effort over centuries. A organism of continued growth, added to, and augmented. Where growth is born of necessity. Where each participant becomes a contributor in a long chain that continues to evolve with every craftsman who might choose to join in the practice of a living tradition. Here buildings cannot be born from individualistic tendencies. The idea of an individual ownership finds no platform. The individual human effort finds place, but no mention. Neither is each building seen as individual, complete, or absolute in their own right. Each is a part of a larger whole. Each individual ownership is a tile in a large mosaic. The built environment draws on and from a collective, and culturally owned set of reference that have been developed for a specific place, and program that has remained largely unaltered for as long. With every reflection new questions arise with new possibilities for anwers. With older learnings to rubbish the schooled opinion. I am not certain how one reacts and so learns from such encounters. I feel a certain confusion. This might be made of three parts, the first being the act itself - of taking down and rebuilding a historically and culturally significant building in what we might call a casual manner. The second, that our education continuaously attempts to deny access to a body of learning that is more accessible than the Khans and Corbusiers and so does not equip me to assimilate it. And the third - a view that buildings must die and so be rebuilt. And that mortality, death and decay might be part of the answer to restore the disrupted balances of resources and establish a more sustainable future. The western Christian world sees life as ending with death. Immortality is its response to the problem of being erased from the surface of the planet. Much of the architecture we practice, and the entire tradition we practice in operates within this theological construction. In the Buddhist and Hindu tradition rebirth removes the need to be remembered. Life continues, in new forms, in new worlds, to new purpose. The last life is not ended, this life is not begun, each flows seamlessly from one into the other. And the permanent memory finds little relevance. The coming of modernism to India, and its continued practice as an architectural idiom does some times hark back to a craft tradition.Where our many schools train students to produce and reproduce its many motifs, type, insignias, models and idioms. To commit to memory its syntax and order. Somewhere in that great moment of freedom and the emergence of the new India our great leader(s) failed to recognize that the temples of modern India are the temples of an ancient India. We practice the modern Indian architecture with a continued detachment from what went before. How do we see ourselves? Is architecture is also about stance? What is my stand with reference to the world, the living or the non-living world? What is my stance with reference to the culture I live and operate in, and the traditions that have shaped its present. And what is my stance as an intervening agent, as a operative in a larger history? How does one find relevance in the larger body of work or collective? Or is the question irrelevant in our adoption of a uniform and common aesthetic and reference. Or is our pattern-book modernism the stance. Irreverent, sometimes illogical, some times and so schooled. There are great lessons to be learnt from the age old building practices we encounter. Sophisticated and accurate, well beyond what any industry rating would have you believe. Answers which may be far more relevant now, in this age of critical environmental consequence, than they have been in the past. To hark back to centuries old traditions and sensibilities towards the built environment is not anti – progressive or anti- modern. The vernacular, needs-based architecture of our ancestors still might have answers we will need to examine to the questions of today. Answers we must be willing to see at the risk of rubbishing many dogmas and dictats of a modernism in a west-facing imperialistic hangover. Those two days at Saharan, as I look back now, almost a year ago still ask sharp questions. Questions to which I am not certain I have answers, or will be capable of finding answers. It sometimes worries me, to think that I am possibly incapable of the answer any more. Some where in the desire to be turned modern, I had to loose the understanding of an architecture that was mine long before the modernist were born, long before architecture, in the guise we know it, came to India. Some where I lost what could have been my own. Architecture that belonged to one-fifth of the world. Architecture that speaks of the billion we are. Of the many wonderful things, the cultures, crafts and colours and religions that make us, and the lives we live. Architecture that speaks of life: living, dying, and somewhere, rebirth.